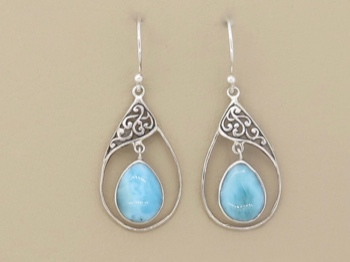 Very special quality larimar stones set in ornate sterling silver open tears. 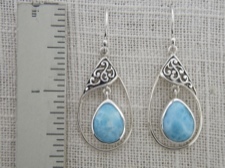 The sterling silver is a suitable frame for these one of a kind handpicked stones. Custom set in Bali. 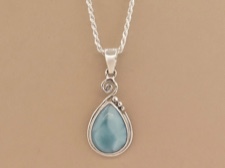 Larimar is named by a peace corp volunteer who found it on the shores of the Caribbean - joining his daughter's name Larissa with the Spanish word for sea, 'mar'. 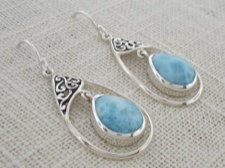 Visitors and residents all love this beautiful blue stone that resembles our clear skies and waters.